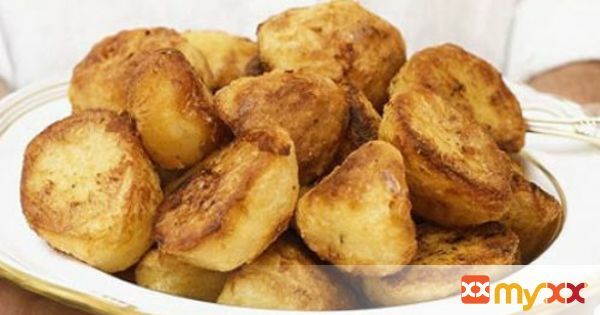 Delicious roasted potatoes - crispy on the outside and fluffy on the inside. Perfect side for roast lamb at your Easter dinner. 1. Heat oven to 400F. Peel the potatoes and halve or quarter, depending on the size. Leave whole if they are very small. Place into a saucepan and cover with cold water, then bring to the boil and boil for five minutes. 2. While the potatoes are boiling, pour the vegetable oil into the roasting pan and place in the oven, on the top rack. 3. Drain the potatoes well and return to the saucepan. Place a lid on top and shake vigorously to fluff up the sides. Sprinkle in the flour and shake again. 4. Carefully remove the tray from the oven and place the potatoes into the tray. Rotate them so that all sides have been covered with the hot oil. Try to keep them from touching each and put in the oven. After 20 minutes remove from oven and using a spatula gently turn the potatoes over. Return to the oven for another 20 minutes. Repeat and return to the oven for a final 20 minutes. 5. Serve hot with your favorite roast meat, gravy and cooked green vegetable.